It's always nice to move to a bigger space, which is kinda weird when you think about it, considering that place is infinite. 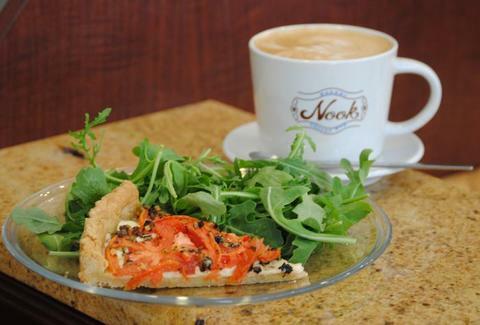 Using their newfound extra room to expand their offerings, Nook Bakery & Coffee Bar. Formerly known as Walnut Bridge Coffee House, Nook's up and moved to a doubly big space with an eclectic interior featuring a warm red-painted floor, dark wood tables and counters, and wooden and upholstered benches, stools, and bistro chairs, amongst which they're doling out baked goods and craft coffees/teas prepped with water run through a 4-stage filter, even though they can't ever get past the third without using Game Genie. Teas skew Japanese and chai and coffees (from One Village and Gimme!) are prepped cold Japanese style (dripped over ice), mixed into the go-to espresso/milk drinks, or served hot via French press; you can also hit their brew bar to pick one of three blends: currently Tanzanian, Ugandan, and an Indonesian/Ethiopian Smart Blend, also an appliance which graduated Phi Beta Frappe-a. Baked goods (made in-house each morning) include gigantic brownies, cowboy bars packed with oats, pecans, coconut, and chocolate chips, and a rotation of lunch stuff like mushroom & spinach quiche and tomato and mozzarella tarts; lunch'll eventually include veggie and meat-filled quiches and casseroles, sweet and savory bread puddings, and savory tarts -- which unlike like their Sweet brethren, will get your house egged if given out on Halloween. For those on the go, they're offering a combo with Greek yogurt parfait with honey & granola, and pre-packed, fresh-squeezed orange and cantaloupe juices, although not Cantaloop, cause that's unfortunately infinite...man, that song is never going away.